Al Fin Energy: 5 to 25% More AC Efficiency from PV Panels? Enphase Energy, a startup in the north bay community of Petaluma, CA, has developed a micro-inverter for conversion of DC power to AC power. By bolting a single micro-inverter to each panel, Enphase claims an improvement of AC efficiency of anywhere between 5% and 25% over the conventional macro-inverter approach. Micro-inverters optimize the voltage-current levels at each panel individually. This squeezes the most power from each panel and then adds it together, increasing the system's efficiency. "Any impact on a module is limited to that module alone," Lee says. 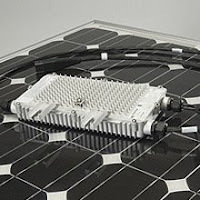 In addition, the equipment cost for micro-inverters is about 15 percent less than the cost for a traditional system, she says, because expensive DC components, such as signal combiners and disconnects, can be replaced with off-the-shelf AC parts. The concept of small inverters has been around for more than a decade, but there have been technical challenges to making practical devices. "One of the biggest stumbling blocks to micro-inverter technologies in the past has been conversion efficiency," says Marv Dargatz, Enphase's senior director for systems. Enphase converted many analog parts in the circuits to digital to make the inverter smaller without sacrificing efficiency. The conversion efficiency of an individual micro-inverter is 95.5 percent, on par with efficiencies of traditional large inverters, which range from 94 to 96 percent. Daniel Kammen, a professor of public policy specializing in energy at the University of California, Berkeley, says that the solar industry has held on to the convention of connecting solar panels in a string since the 1960s, when inverters were expensive. "It's sort of crazy that we still hook solar panels together in series," Kammen says. "You take what's now the most expensive part of the system, the solar panels, and just by the way you string them together you cut down their output." If you are going off-grid with your PV array, you will probably want to stick to the macro-inverter approach, since you will be inserting storage batteries into your system -- which require DC input. But if you are like the majority of next-gen small PV homeowners, you will be grid-intertied and battery-less. In that case, the AC is the only type of power you will need, so you may as well convert to AC as closely to the source as efficiency and affordability allows. Photovoltaic power and wind power both have important niches on the small scale. For residents of the tropics who enjoy a laid back tropical lifestyle, PV may be all the power they will need. But Obama's opium dreams of wind and solar substituting for fossil fuels and nuclear energy are simply fit for zombies, and nothing else. Wind and solar are unreliable, intermittent, and hell on a power grid manager. They are not ready -- nowhere near ready -- to substitute for bona fide baseload power sources.